I am a firm believer in the fact that ignorance of the (country's) historical past, especially of its mistakes --much by deliberate omission in its history, guarantees its repeat; that knowing only the good part of one's history, tends to mold one into believing in its exceptionalism, and with a delusion of grandeur, into believing the country and its people are the "chosen" ones and thus become self-righteous: that his country is always right. For centuries, all these characterized the minds of Western European colonizers who began to lose their treasured colonial possessions after WW2 -- British India and French Indochina to name a couple --with the blossoming of African and Asian nationalism. Thereafter, having led the victory against the Axis/fascist powers of Germany, Italy and Japan, this characterization started to permeate and stay in the closed and ignorant American mind. Any serious survey of American history textbooks and related publications will show that the period of American intervention and colonization of our homeland is glossed over, barely and briefly mentioned, if not completely deleted. A survey of these same books and various publications, then and now, for the Spanish-American War which probably every American grade and high schooler is aware of, yields a wealth of information, of course not necessarily objective too! As is often alluded to: "history is written by victors". The hijacking of our forefathers' nationalist revolution against the Spaniards and the American duplicity that resulted in the brutal American Hidden War against our revolutionaries were and are hidden from view, submerged and /or relegated to a footnote, at best a page or two and if so mentioned as the "Philippine Insurrection." Given such dearth background about our homeland, the common American in the street has been miseducated and made ignorant of truth; thus his unquestioned belief in American Innocence and blind adherence to American Exceptionalism. It was only in 1999 that the American Library of Congress recognized and referred to the so-called "Philippine Insurrection" as the Philippine-American War. Once in a while, a book can be found which coherently demonstrates and reminds us about the "Dr. Jekyll and Mr. Hyde" of American foreign policy, its hypocrisy in the American gospel of "Manifest Destiny" or “Benevolent Assimilation.” One such book is entitled "Habits of Empire," its review by the Chicago Tribune is posted below and followed by an interview of the author Prof. Walter Nugent. [ NOTE: We Filipinos, at home and abroad, seem to have arrived and deteriorated to a similar intellectual emptiness and predicament, but with greater and worse results for our fellow countrymen "left behind". As time went and goes by, given the mis-education, mis-information, dis-information, and omission in the study, knowledge and understanding of our homeland's history; we were and are continuously led to ignorance of our peoples' nationalist history; all thanks to our 50-years of colonial and thereafter neo-colonial education, which caused our naïve sentimentality and thus openness and preference for the foreign and the foreigner before we learn/know about and understand our Filipino selves. And thus we as "a people"are not really a people, but have turned into individualized strangers in our own homeland; a homeland we never knew because we neither did care nor learned nor desire to know. And so our neglect of and ignorance about the homeland make us lose it; and our great loss is a great gain to foreigners: American, Chinese, Japanese, Korean, etc. 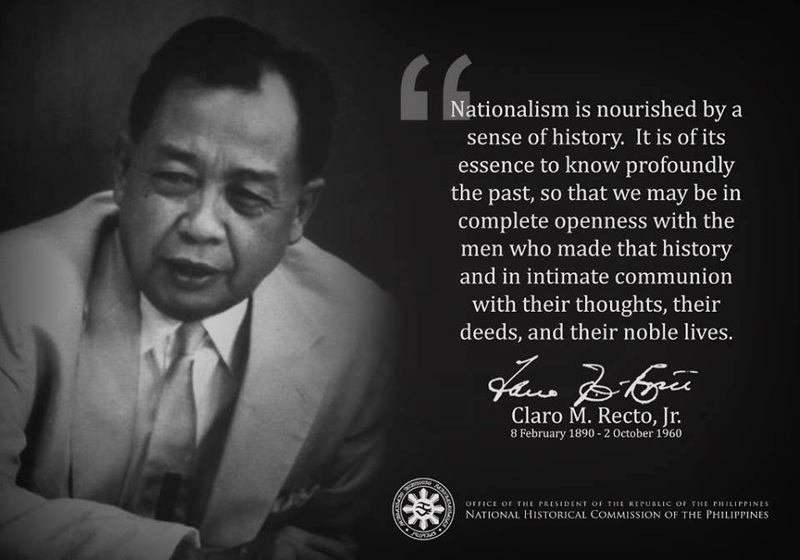 who have made our homeland a paradise only for themselves and their few, westernized and monied native Filipino partners. Walter Nugent's "Habits of Empire"
Many of those who oppose U.S. intervention in Iraq say President Bush has recklessly abandoned America's long tradition of peaceful diplomacy and replaced it with an aggressive policy of starting wars, seizing lands and oppressing nations. Not true, argue others who are familiar with American history. They point out that the U.S. has been pursuing this policy for more than a century, since President Benjamin Harrison landed troops in Hawaii in 1893 and President William McKinley seized Cuba, Puerto Rico and the Philippines five years later. Walter Nugent, an eminent historian who spent decades teaching at the University of Notre Dame and Indiana University, agrees with this argument but takes it a step further. The real roots of American expansionism, he asserts, lie farther back than the 1890s. When the U.S. won its independence, it was only a string of colonies along the Atlantic Coast. How did it expand so far so quickly, coming to occupy much of a vast continent? That is the story Nugent sets out to tell. His book, "Habits of Empire: A History of American Expansion," begins with the first migration of settlers into the Appalachians, and then proceeds to explain how the U.S. acquired Louisiana, Florida, Texas, Oregon and California. "Americans acquired each parcel of real estate . . . by diplomacy, filibustering, armed conquest, cheating and lying, ethnic cleansing, even honest purchase and negotiation," he writes. "Without the easy victories of the continental conquest, Americans might have paused and reflected before extending themselves across the western and southern oceans and, after 1945, around the world." By making this case, Nugent joins a growing number of scholars and others who view American history—and the modern history of the world—in a new way. They have two essential insights.The first is that this history can be best understood by studying the record of American—what shall we call it?—expansionism, interventionism, imperialism, or simply, as U.S. Sen. Henry Cabot Lodge named it more than a century ago, "the large policy." During the 20th Century, the course of American and world history has been profoundly affected by U.S. interventions from Iran to Vietnam to Chile. Nugent argues that these interventions were a logical extension of early U.S. expansion within North America. The second insight helping Americans see their history more clearly is that to study these interventions as a series of separate, unrelated episodes is to miss their grand historical importance. Only by studying them together, as part of a single, long continuum, do patterns and lessons become clear.The spectacular doubling of U.S. territory that resulted from the 1803 Louisiana Purchase, Nugent finds, was highly suspect on three grounds. By law and treaty, France had no clear title to Louisiana, had promised upon acquiring it from Spain never to sell it to any other power, and could in any case make no such sale without the permission of parliament. That led historian Henry Adams to describe the purchase as " 'trebly invalid.' " President Thomas Jefferson and Secretary of State James Madison knew all this but, as Nugent writes, "The temptation, the opportunity, was too great for even Madison the constitutionalist and Jefferson the arch-democrat. Imperialism trumped honesty." No such opportunity presented itself in Florida, Texas or the Oregon Territory, which includes not only today's Oregon but also Washington, Idaho and large parts of Wyoming and Montana. In those places, U.S. presidents used variations on a tactic that their successors would later use to seize lands overseas. They encouraged white settlers to migrate into lands the U.S. coveted, then waited for inevitable incidents or fomented them and used these incidents as pretexts to invade and seize the territory they wanted." 'A revolt, or at any rate, a united representation, exhibiting every appearance of spontaneity, would best serve the purpose,' "
Secretary of State Robert Smith wrote to the territorial governor of Mississippi as the U.S. used this tactic to capture Florida from Spain in the second decade of the 19th Century.Texas was perhaps the purest example of what Nugent describes as the U.S. strategy of "infiltration, insurrection, and an American military takeover 'to restore order.' " Mexican leaders agreed to accept white colonists in Texas, then part of Mexico, as a buffer against hostile Indians. Lured by cheap land, colonists poured in by the thousands. The Mexicans realized too late that, as Nugent puts it, "the buffer policy had become the fox-in-the-chicken-coop policy." The deliberate fomenting of rebellion in Texas and its subsequent annexation to the U.S., part of a carefully laid plan designed in Washington, led to the first great anti-imperialist outburst in American history. Former President John Quincy Adams called it " 'the apoplexy of the Constitution.' " Future President Ulysses Grant, then an army general, described the Mexican War of the 1840s as "one of the most unjust ever waged by a stronger against a weaker nation." Their dissent set a pattern for protests against U.S. attacks on foreign countries: They would be persistent, often articulate, but ultimately unsuccessful.Americans, it seems, are deeply attached to the idea that their country has much to teach others and should use whatever means are necessary to spread its influence and power. The U.S. has intervened in more countries further from its shores than any nation in modern history. Why is this? Historians have come up with a variety of answers. The push for expansion has always been largely economic, whether it involved the desire for land in Texas, markets in China, or oil in Iraq. It is also based on the diffuse sense of American exceptionalism, the idea that the U.S. does not need to play by rules that bind other countries because the American cause is so transcendently just and American hegemony so universally beneficial. Racism has also played an important role by underpinning the view that certain nations and races—our own, for example—are inherently more qualified to rule than others. To these explanations, Nugent adds the idea that the American instinct to invade and overthrow grew in part from "a newly conscious masculinity, a seeking of power abroad (military or maritime) as a kind of chest-thumping." Nugent's work is deeply valuable to all who seek to understand not only American history but the ways that history has shaped the world. He recounts events coolly and authoritatively, without offering much in the way of suspenseful stories or insightful background about key figures. This book's drama lies in its historical sweep rather than page-turning tales of intrigue, war and conquest. Some readers might wish Nugent had offered more sweeping reflections on the meaning of the story he tells. Simply presenting the story in a coherent way, though, is an enormous contribution to our national self-knowledge. "Habits of Empire" returns often to the fate of Indian tribes that were displaced or wiped out by U.S. takeovers of their land. President James Monroe insisted such takeovers " 'promote the interest and happiness of those tribes' " so " 'we become in reality their benefactors.' "
Today's rhetoric about bringing the blessings of democracy and globalization to backward nations sounds not much different. All who must help decide the future course America should follow in the world—meaning every voter—should be aware of the history of U.S. intervention, including the early episodes Nugent describes in this book. "Since its beginning the United States has oscillated between republic and empire, the institutions and ideals of the first coexisting uneasily with the behavior of the second," he concludes. "The rhetoric of the republic continues, but the realities of statecraft, with wide popular support, have become increasingly imperial. The past is indeed irreversible, but the future demands a choice, and a historically informed one: republic or empire? The balance, never perfect, present since this country's first days, has been perilously tipping." Mr. Liebers is an HNN intern. Historian Walter Nugent is the author of the just published book: Habits of Empire: A History of American Expansion (Knopf, 2008). He is a member of HNN's advisory board. He was interviewed by email in June. Q: America’s history is rife with institutions that were both lamentable and profitable. Did American empire-building take hold as an economic force, or do you argue that there were other equally important forces at work? A: Economic interests certainly played a role. In what I call our first empire, the continental one by which we grew from thirteen Atlantic coast colonies all the way to the Pacific in less than seventy years, the settling of successive Wests meant economic opportunity for millions of homesteading families and others. It also involved grabbing land from Indians and others who were in the way of the settlement process. In our second, offshore empire across the Pacific and around the Caribbean, commerce was a major motive. William H. Seward, years before he bought Alaska, proclaimed that “the commerce of the world is the empire of the world.” Our third, post-1945 empire has involved globalization. But most of my book is on the first empire, where we learned the habit of empire-building. And that continental empire involved not only economic interests but ideology – Jefferson’s “empire for liberty,” the 1840’s “Manifest Destiny,” and other phrases – and certainly demography. The extraordinary fecundity of nineteenth-century frontierspeople allowed us to occupy and settle the land mass and solidify what was gained from diplomacy and conquest. Q: In your mind, what was the most important moment in American history that cemented the notion of imperialism and empire-building in the political ethos and cultural conception of America? A: I don’t see any one moment as decisive. The idea that we had a right, even a duty, to spread civilization and push back “savagery” is as old as the wars against the Powhatans and the Pequots. Beginning in 1782, when we acquired Transappalachia (without either conquering or, as yet, settling it), we reinforced the imperial habit with each successive acquisition. The majority of Americans, historically, have regarded that as natural and normal. Opponents there have been, to be sure, as in 1846, 1898-1900, 1968, and today, but they have seldom or only tardily prevailed. Q: Thinking counterfactually, and given our knowledge of colonial American history, is there a viable alternative to the empire-building America that became? A: Not likely, given attitudes toward Indians, Spaniards, Mexicans, and others along the way. The habit of empire seems to me too deeply ingrained, throughout our whole history, and too often reinforced, particularly by our relatively quick and easy capture of the continental land mass. Q: When one thinks of empires and their sequel, great collapses, clashes of civilization or prudent contraction all come to mind as the “historical next step.” This is outside your role as a historian, but how much confidence do you have in America’s habits and what they might mean for us (as Americans) in the 21st century? A: I suspect that the habit is still with us, and strongly. We have lived for over two centuries with the contradiction in Jefferson’s phrase, “empire for liberty.” We have had the forms and the rhetoric of a republic but have very often behaved imperially, i.e. imposing our view of things on others, benignly or forcefully, whether they wanted it or not. We’ve been warned about “imperial overreach” but done little to heed the warning. We don’t like to think of ourselves as an empire, because (as Gibbon taught us), empires decline and fall, and we don’t want to contemplate that. We prefer to think of ourselves as a people of frontiers – because frontiers can (in theory) go on indefinitely. Q: What was your intention in writing the book? A: At the outset I wanted to tie together the territorial acquisitions (traditionally the domain of diplomatic historians) with the settlement process (traditionally done by Western historians), which seem to me to be two sides of one historical coin. Further, I wanted to write a continuous narrative of all of the U.S. acquisitions, not just one or a few. And I wanted to do it with empathy for the positions of those who gave up the territory: the Indians, the Spanish, the Mexicans, especially, and after 1850, the Hawaiians, Samoans, Filipinos, and others. To get the “other sides,” I read Spanish, Mexican, and other documents and monographs. I had expected to stop with the conquest of the Southwest and the 1848 treaty with Mexico, but of course we kept on going, at first territorially, and later (and nowadays) through economic, political, and military power. Each acquisition, for me, became an episode in a continuous story, and together they comprise the historical foundation of where we now are. Walter Nugent is Tackes Professor Emeritus of History at the University of Notre Dame. He taught history at the University of Notre Dame for sixteen years and at Indiana University for twenty-one years before that. As a visiting professor he has also taught, lectured, and lived in England, Israel, Germany, Poland, and Ireland. He has published eleven previous books and nearly two hundred essays and reviews. He is a past president of the Western History Association and a former member of the Council on Foreign Relations.